Looking to reach your target audience in an efficient and targeted way? The days where display ads were efficient and had an impact on people are over. Today, if you want to succeed in the marketing world – you have to play a completely different ball game. If you want to have a successful marketing campaign, you must take help from those who have the biggest impact on your target audience. Thankfully, you have influencers. If you’re completely new to influencer marketing, we’ll take the short version to quickly explain it. Influencer marketing is just what it sounds like. Marketing with the help of people with influence. It is also a form of marketing that is all about finding leaders and high-authority individuals within a particular niche. The goal with influencer marketing is to run a very targeted marketing campaign in order to reach out to a larger audience (a very targeted one) with the help of “influencers”. Some ways to cooperate with influencers are highly effective while some are less effective. This is why it’s important to put your focus where you can generate the best results and get the highest ROI. This is one of the most, if not the most efficient way to generate beautiful results with influencer marketing and if you’re a regular social media user, you can’t have helped to come across at least one giveaway that has been made in partnership with an influencer. 90% of bloggers like to arrange giveaways for their followers/readers. Running giveaways together with influencers has two main advantages. First of all, as mentioned, many influencers love to arrange giveaways for their followers. This means that by partnering up with you, they can run giveaways without having to give something away themselves. This in turn will result in the fact that most of the influencers you ask to run a giveaway with will happily accept the offer, making it less of a struggle for you. Secondly, giveaways normally result in a considerably larger reach than if the influencer would just post a marketing post of your product. The reason to this is that often, the rules to entry a giveaway is to tag friends in the picture etc. In short, this leads to a very large reach, very quickly. If you don’t have a particularly large following on social media, it is difficult to run giveaways where you’ll get lots of contestants. Therefore, the method of using trusted influencers with a large following base to promote the contest will generate tons of new followers to you, increase your brand awareness and very likely – result in more sales. Quite similar to giveaways but the main difference is that you are gifting your products to the influencer instead of giving away them to their followers. This is one of the most popular ways for brands to cooperate with an influencer. Depending on the value of your product, larger influencers might want to receive a payment on top of the product they receive but many of the smaller influencers (also known as micro-influencer) will happily satisfy with a product from you as long as it interests them. This is also a reason to why you have to target the influencer you are partnering with. For example: If you’re looking to gift costume shoes to an influencer who only wears streetwear, you have two problems. First of all, there’s a big risk that the influencer won’t accept your offer. Secondly, if they do accept your offer and post an image of them on their social media, the influencer will lose a lot of their credibility because people will see straight thorough the promotion due to the fact that they know the influencer would never wear them in reality. Ultimately, this will result in a poorly generating campaign with a low ROI. Therefore, whatever you do – choose your influencers wisely. Another benefit of gifting the influencer your product is that it is often a more cost-effective way of gaining exposure than if you would just pay the influencer. This means more exposure for your marketing budget. Yes please! The final benefit of gifting influencers is that you get golden content. Most often, when the influencer receive products from you, they are the one taking the photos and creating the content. Content that you can use afterwards as well! This is more common on blogs but it can be done on social media as well. Send your products to some influencers (and pay them depending on how big of a following they have) and ask them to write a review of your product. A lot of influencers will gladly do this as it gives them something to write about and on top, they get a free product. As we talked about earlier, it’s important that you are only targeting influencer in your niche because influencer who posts sport-related content will probably not write a review about your makeup and their followers will probably not be interested in that either. With the help of VeloceNetwork influencer directory, you can filter and choose suitable influencers in a heart beat. Reviews are a great way to generate exposure and website traffic. Hopefully, the influencer’s blog has some kind of authority and when they link to your website, Google will sense this and might rank you higher on its search engine results page. Apart from that, direct traffic (people who clicks the link in the influencer’s article) will also be generated to your site. As a final bonus, you’ll also get free content which is great for your website. Not only does more (and more high-quality) content help you rank higher on search engines, having “testimonials” and reviews of your products by trusted individuals as influencers are, also lets you have a bigger impact on your website visitors. Depending on how much you have worked with SEO and optimising your website, there’s a big chance that the influencers’ website will have a higher authority than yours. Making a long story short, this basically means that their website ranks higher in search engines. Let’s say you are targeting a keyword such as “mascara”. Getting on the top search results is almost impossible due to the fact that large corporates such as L’oreal has already targeted these keywords with their extremely high-authority website. With the help of blog articles on influencer’s website however, people can search for a keyword, find the influencers’ website and then click-through to your website giving you a kind of leverage even if you aren’t directly positioning on top SERP (search engine result page) with your own website. Have in mind that reviews are the true opinions of the influencer. This means that if they found your product terrible, they might write it in their review. Do not forget to ask them to link to your website in the blog post because otherwise, many of these practices won’t work. Video marketing is growing and is as influencer marketing a natural part of many brand’s marketing strategies. When looking at the statistics of video marketing, there’s no question to why this is happening. 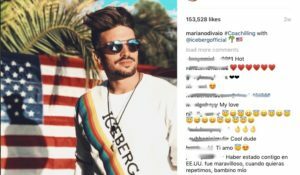 There are tons of influencers on video platforms such as YouTube and even here is VeloceNetwork playing an important part in your influencer marketing campaign’s success. In the influencer directory, filter on platform (YouTube) and then your other preferred criteria such as gender and niche and then scroll through the most relevant results, choosing the one you believe fits your brand the best. The reach potential on YouTube is enormous. Influencers can make a video that is interesting and appealing around your product and attract many viewers – giving your brand great exposure. Apart from the fact that videos are having a bigger impact on people than text and images, videos are also the most shared media content online. 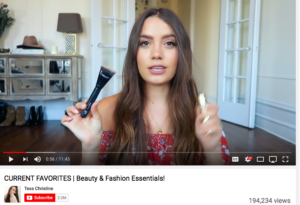 Here we can see beauty blogger Tess Christine marketing makeup products on her YouTube channel. This particular video was able to generate 194,2234 views which is a ton of exposure for the makeup brand she’s recommending in the video. Choosing influencers that speaks the same language as your brand and is within the same niche is extremely important for a successful influencer marketing campaign. These 4 tips mentioned above have shown to be able to generate the best results within the influencer marketing world so why not try them yourself? Try them out and let us know if they were successful for you!